Popular Mechanics magazine was the place to look for innovative gadgets and machinery; do it yourself projects for the man who was a little handy with some tools and in 1967, that’s how John Ranger’s first bike came to be. His father, Hector, built a minibike from the book’s plans using a bicycle frame, a Jacobson lawnmower motor and wheelbarrow wheels. John grew up in Port Colborne and once the minibike was completed it wasn’t long before he was out tearing around the course behind Robin Hood Flour Mills. From the minibike, he acquired a 250 Montessa Scrambler from John Clare’s in Fonthill and in 1968, Clare sponsored him in motocross on a 250 Yamaha DT1 with racing kit but this wasn’t quite his thing. John took part in all types of events but decided to concentrate his efforts and polish his natural skills in trials competition where you are judged by your skills in negotiating difficult terrain. He starting competing in Trials in 1969 as a Junior and as a Senior in 1970, won the premier award at Oshawa beating all the experts on the 250 Greeves so was moved up to Expert for 1971. Dad again came through for him with a brand new Bultaco Sherpa T250 in October and John won the Premier Expert award at both Welland County and Pickering. Hector is a machinist at Inco and tuned John’s bikes but it wasn’t long before John was doing it all himself. 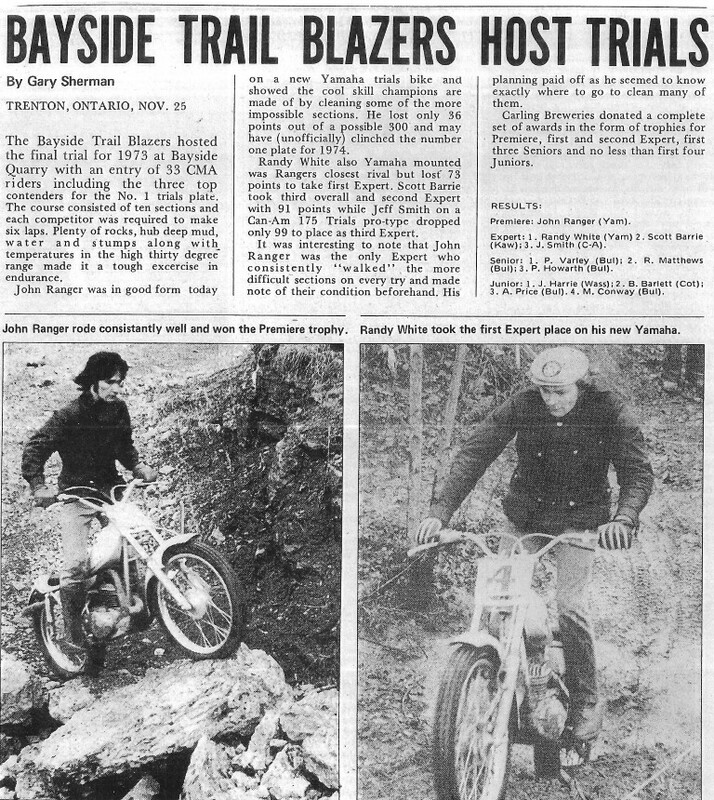 In 1972, John was one of the instructors at the junior trials school in Waterdown using the Bultaco but in September he received a 250 (John Jones) Kawasaki prototype from F. Manley Ltd. in Don Mills. This was his ride for the North American National Championship trials in Michigan and he placed 5th. Continuing with the Kawasaki to Rougemont, Quebec for a three day event, John was the overall Premier winner and the Canadian National Champion. The Kawasaki also performed well at the El Trial de Espana in California, where he placed 4th in the Masters Class behind Sammy Miller and two American riders. Ranger was the runaway trials winner for 1972 with almost three times as many points as the second runner up, set a new Canadian National points record and his first Number one plate. Kawasaki used John’s photo in their advertisements in the motorcycle magazines and at dealers. However there were problems with the availability of parts for the machine and the company answered John’s complaints by sending him a 450 motor from Japan especially designed for trials. John spent the winter of 1972 & 1973 installing the motor in the prototype Kawasaki taking it to the machine shop where he was apprenticing as a tool and die maker. The frame had to be cut to mount the motor and many other details had to be addressed. It was completed for the start of the 1973 season and John won the 1st trials event at Welland. 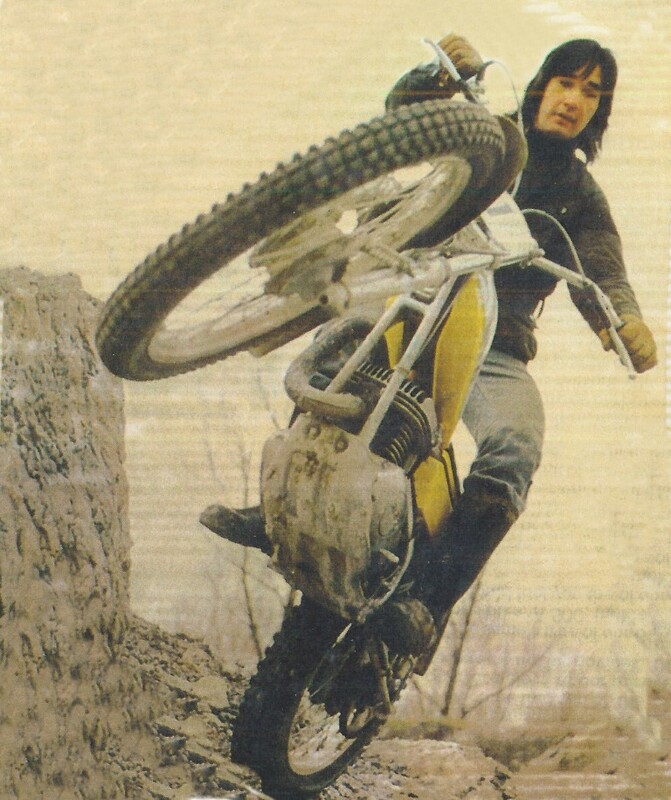 John then decided to leave the Kawasaki sit and ride the 250 Bultaco which ended his sponsorship with Kawasaki. For the majority of the season he was sponsored by Canossa, Windsor, riding a 250 Ossa, with Helmut Classen to provide any needed parts. Before the season was over, he was offered a sponsorship from Yamaha Motor Canada Ltd. to ride their newly developed, by Mick Andrews, TY250 trials bike. After a few modifications, Ranger competed successfully on the Yamaha for several years. 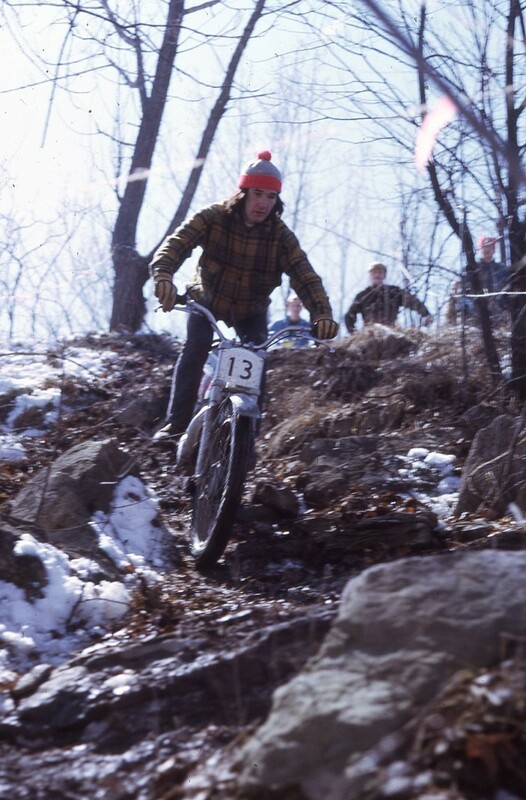 In 1977, he was sponsored by Sonic Cycle in Toronto riding a 350 Bultaco and placed 1st Expert at Motopark. John won 5 National #1 Plates from 1972 to 1976 and 3 Canadian Championships. For 1972, John received a recognition award from the province of Ontario for his athletic accomplishments. In 1974, he was chosen as the male athlete of the year by the Port Colborne Sports Council. For a good ten years, John was totally absorbed with motorcycles to the point that he dropped out of an engineering course at the University of Waterloo in the early 70’s. Although he regrets not getting the education, he isn’t sorry as he was able to obtain a good job later with General Motors as a tool maker. John did feel that he needed to experience other things in life and although he loves competing and bikes, still has several in the garage, it was time to move on. We welcome John Ranger as a 2015 Inductee to the Canadian Motorcycle Hall of Fame.